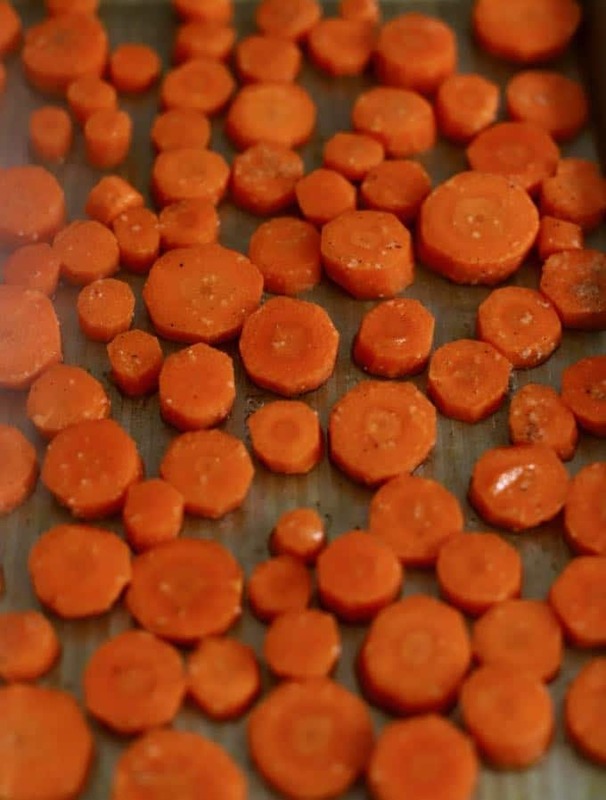 This recipe for Copper Pennies, which are also known as Marinated Carrots or Sweet and Sour Carrots, consists of carrot medallions marinated in a tangy tomato sauce. 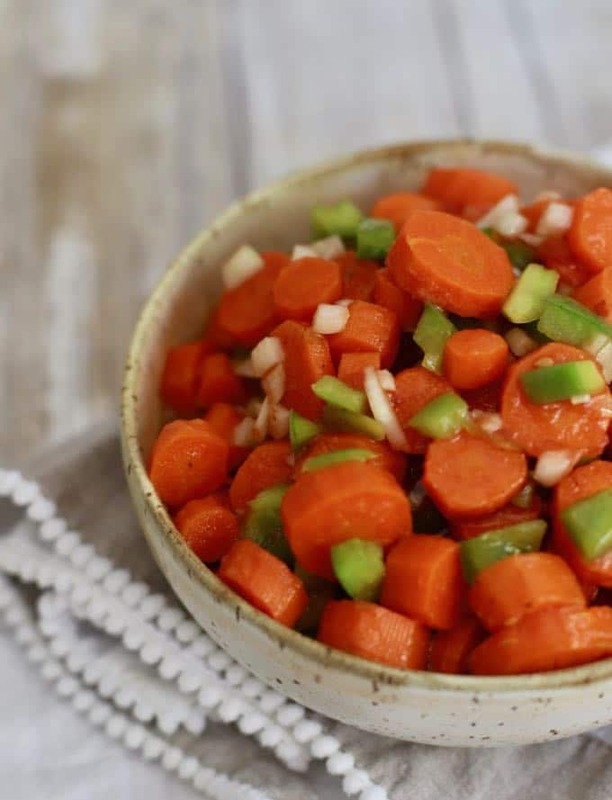 It’s the best carrot side dish ever and is perfect for just about any occasion. You might say its “Copper Pennies from Heaven”! Recipes for Copper Pennies have been around forever and most called for boiling carrots and then marinating them in a mixture of canned tomato soup, vinegar, vegetable oil, and sugar. Now don’t get me wrong, this old-fashioned recipe was good. But, I like this updated Copper Pennies recipe much better and I think you will too. First, I roasted the carrots for maximum sweetness. Then, I reduced the amount of sugar and used pureed whole tomatoes instead of tomato soup. I substituted olive oil for vegetable oil. And finally, I added just a touch of Worchester sauce and dried mustard for more tang. Whether you call them Copper Pennies, Marinated Carrots, or Sweet and Sour Carrots, they are delicious and pair well with any main dish. They would make a great Easter side dish. Copper Pennies are also perfect for potlucks and picnics, make a wonderful topping for salads, and are so easy to make! 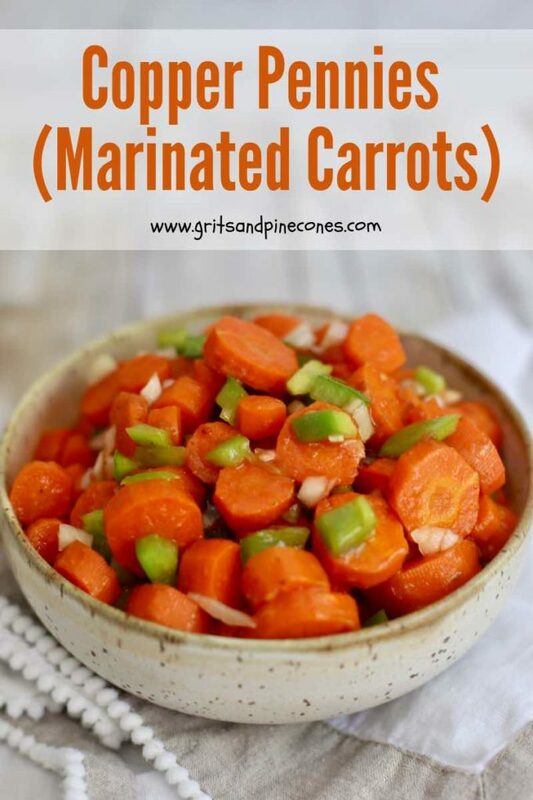 Even if you’re not typically a fan of cooked carrots, this recipe is a must try. It just might make a carrot lover out of you! If you like this make-ahead vegetable side dish recipe, I know you will love these popular recipes too: Southern Baked Pineapple Casserole, Baked Mushroom Casserole, Southern Sweet and Sour Green Beans, and Baked Southern Candied Sweet Potatoes. Need more ideas? Check out all of my side dish recipes here. 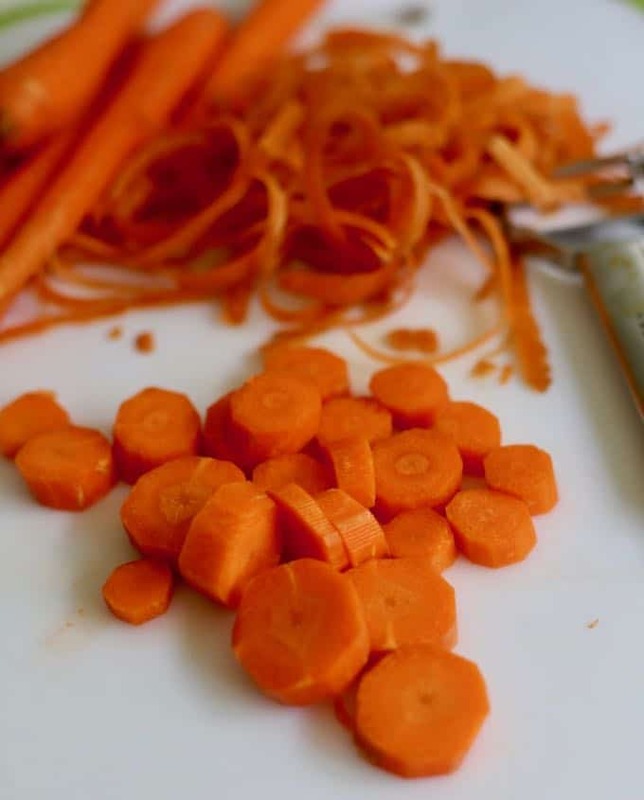 Peel the carrots and slice them into approximately 1/4-1/3 inch thick medallions. Place them on a baking sheet and top with the olive oil and salt and pepper. Toss to combine and when the carrots are coated spread them out evenly in a single layer. Roast for approximately 10-12 minutes for crisp-tender carrots. If you like your carrots more well done, leave them in the oven for a few more minutes. Test the carrots by sticking a fork in them. When the carrots are done remove from the oven and allow to cool. Set aside. While the carrots are cooking, combine all of the marinade ingredients in a small saucepan and bring to a boil over medium heat. Remove the marinade from the heat and allow to cool. Add the carrots to the marinade, cover and refrigerate overnight. To serve, either drain the marinade or use a slotted spoon and serve cold or at room temperature. I didn’t have tomato sauce so I used my immersion blender to puree a can of whole tomatoes and juice. Then I measured it out. 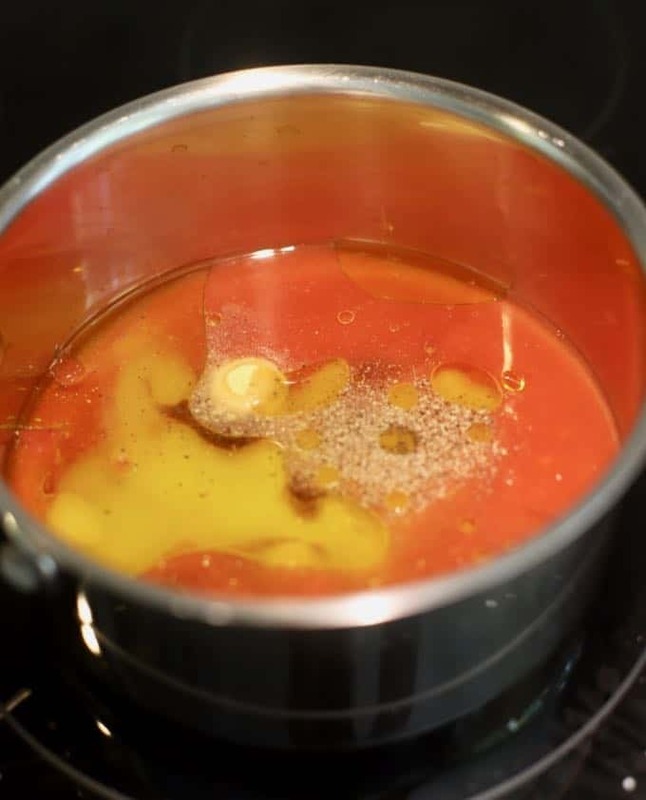 You could also substitute pureed canned diced or stewed tomatoes. Copper Pennies will keep covered in your refrigerator for several weeks. You can substitute apple cider vinegar for white vinegar. The roasted carrots by themselves are also delicious topped with some fresh dill or parsley and served as a side dish. 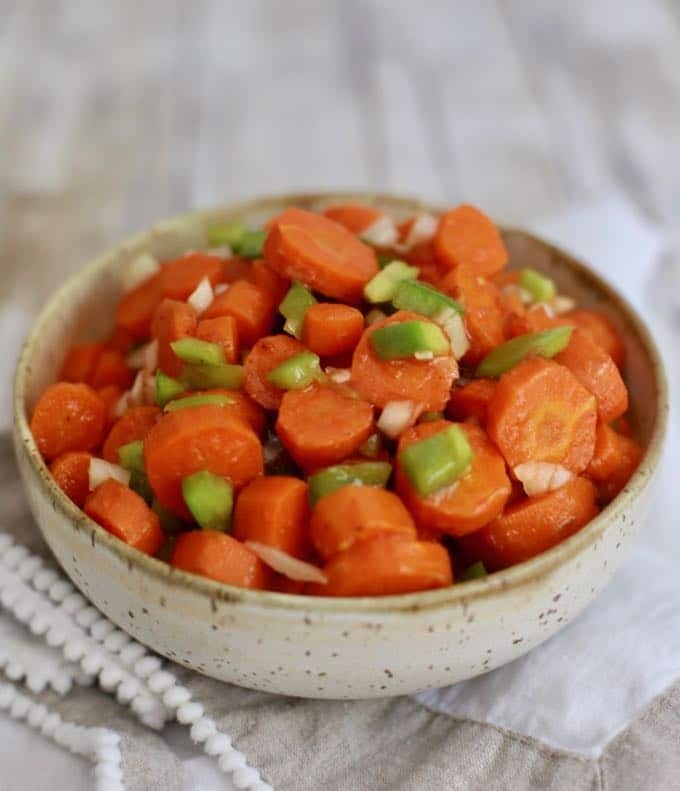 This recipe for Copper Pennies which are also known as Marinated Carrots or Sweet and Sour Carrots consist of carrot medallions marinated in a tangy tomato sauce. 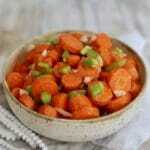 It's the best carrot side dish ever and is perfect for just about any occasion. To serve, either drain the marinade or use a slotted spoon. I didn't have tomato sauce, so I used my immersion blender to puree a can of whole tomatoes and juice. You could also substitute pureed canned diced or stewed tomatoes. I love your posts Sharon because it introduces me to so many recipes I’ve not heard of or made before. This Copper Pennies recipe is just that. It sounds so delicious with all the ingredients in the marinade. Thanks for all your inspiration.